If you want to outsource your accounting, it’s as easy as Googling “accountant near me.” Why is that a good thing? Until recently your accountant search might have generated a list of online companies located in Texas or Los Angeles. Considering our global online reach, you might have even pulled up accountants in India or the Philippines. Of course, you’d never realize your search didn’t include an accountant near me unless you checked the street address at the bottom of the web page. That was before Google made searches more genuine and relevant. 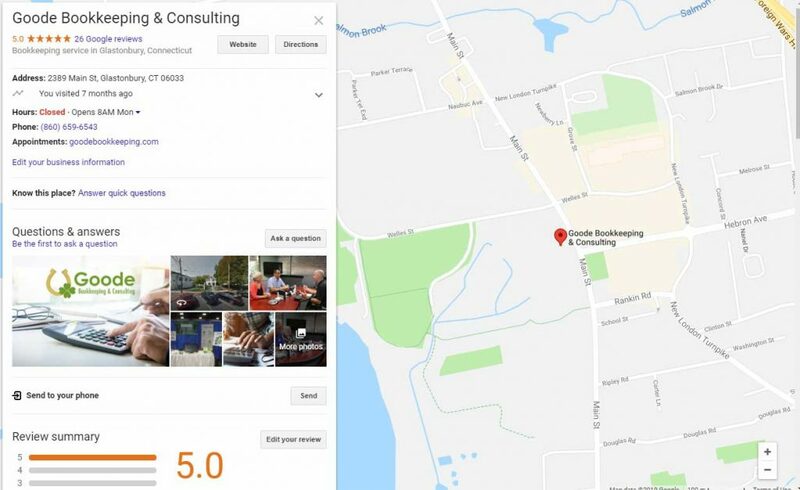 Now if you’re in Glastonbury, Connecticut searching accountant near me you won’t usually get a firm that’s a thousand miles away. You’ll get a company like us, the accounting professionals at Goode Bookkeeping and Consulting. You could outsource your accounting to an online service anywhere in America or the world. Whoever you find might do a great job. But what if you wanted more from the people who track your finances and do your taxes? What would you do if you wanted to stop by and talk about your financial data or pick up a tax document? What if you wanted to meet the face behind your accountant near me? At Goode Bookkeeping & Consulting we do the same things other outsourced accounting services do but we offer a few key differences we’re sure you’ll appreciate. We’re accounting professionals. Shannon Goode is a CPA with 20 plus years of accounting experience. We provide small business consulting services. We’re local. And when we say “local,” we’re not talking about 100 miles away. We’re your accountant near me in Glastonbury, right here on Main street. We’d love to meet you. Stop in if you choose. If you’re like many other small business owners and you’re too busy to stop in, wave at us as you drive by. At Goode Bookkeeping & Consulting, we’re accounting professionals. We handle bookkeeping, invoice management, payroll, bill pay, and other small business services. To learn more, give us a call at (860) 659-6543. If you’re too busy during regular office hours, get in touch with us by completing our online contact form.